The Pledge of Resistance is co-sponsored by Code Pink, Women’s March on the Pentagon, Committee for Peace and Human Rights, Popular Resistance and Alliance for Global Justice. The United States government, in complete violation of international laws and norms has declared its intention to remove the democratically elected government of Venezuela and replace it with an unelected president, Juan Guaido, who never won a single vote in a national campaign. The US has illegally seized Venezuela’s foreign assets and claims to be making them available to the opposition, an act which, on top of the already severe and illegal sanctions, exacerbates the suffering of poor and working Venezuelans. Without regard to how we individually feel about Venezuelan President Nicolas Maduro and the Bolivarian Process put in place by the late President Hugo Chavez, those of us in the United States must oppose the illegal actions of our government. 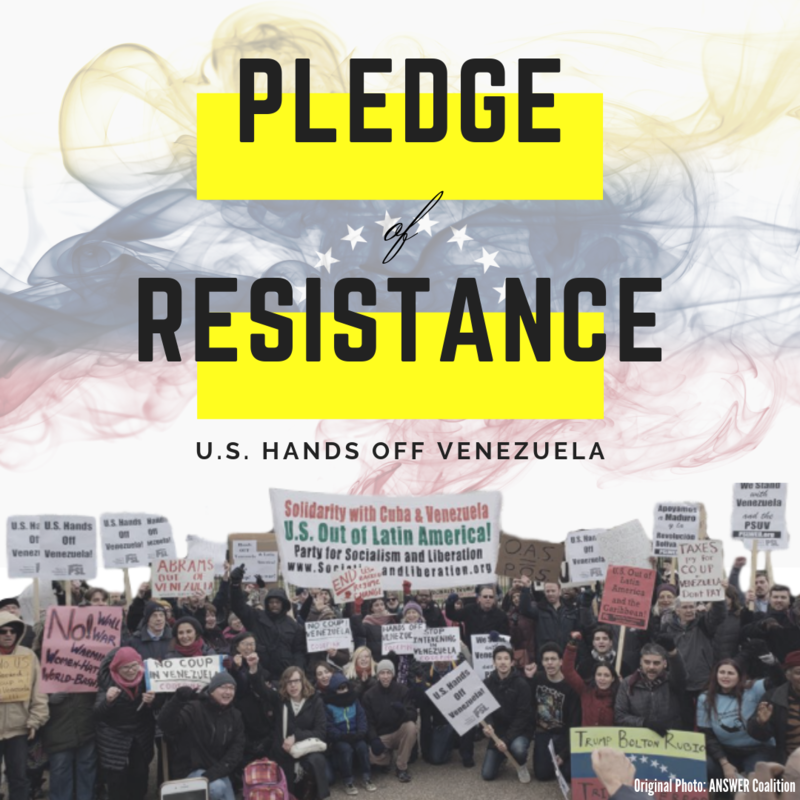 We urge you to sign the Pledge of Resistance and to organize yourself with others in your community to respond within 24 hour with direct action if the US invades Venezuela or in response to a call for direct action from the combined co-sponsoring groups. I pledge to join with others in my community to perform direct action and risk arrest if the US invades or otherwise overthrows the democratically elected government of Venezuela. Pledge to print: These images than can be used to print, sign and keep in pocket. They can be printed as small as the size of a wallet. Scale-able flyer: This can be printed out as a poster flyer or a really tiny flyer. It works well to print 4 and 6 to a page.